Dill is the common name for an aromatic perennial herbaceous plant, Anethum graveolens, in the parsley family (Apiaceae), characterized by slender stems, finely divided leaves, and small white to yellow flowers in small umbles. Dill is the sole species of the genus Anethum, though classified by some botanists in a related genus as Peucedanum graveolens. Dill is a popular commercial plant for culinary purposes, as well as used medicinally. Its dried fruit, known as dill seeds, is used as a spice; its strong pungent and bitter taste finds its chief use in flavoring pickles (dill pickles) and sauces and making dill vinegar. The leaves, known as dill weed or dill, are used as herbs; their distinctive flavor, mainly in fresh form, but also used dried, is used in flavoring salads, meats, vegetables, and sauces. An essential oil from the fruit (dill seed oil) and leaf (dill leaf oil) also are used for various purposes, such as food flavoring, medicines, and perfuming soaps. Medically, dill has been used for over 2000 years, and is particularly well known for soothing the stomach after meals. Dill also provides a larger function for the ecosystem, not only as a food for herbivores, but the scented flowers provide food for bees, who in turn pollinate the plants. Dill is part of the flowering plant family Apiaceae (or Umbelliferae), a group of usually aromatic plants with hollow stems and radially symmetrical small flowers with 5 small sepals, 5 petals and 5 stamens. In addition to dill, members of this family include such well-known members as parsley, cumin, carrot, caraway, fennel, parsnip, celery, and Queen Anne's Lace. Dill grows to 40 to 60 centimeters (16–24 inches), with slender stems and alternate, finely divided, softly delicate leaves 10 to 20 centimeters (3.9–7.9 inches) long. The ultimate leaf divisions are 1 to 2 millimeters (0.039–0.079 inch) broad, slightly broader than the similar leaves of fennel, which are threadlike, less than 1 millimeters (0.039 inch) broad, but harder in texture. The flowers are white to yellow, in small umbels 2 to 9 centimeters (0.79–3.5 inches) in diameter. The "dill seed" is actually the dried fruit of the plant, and is flat, oval, and tan to dark brown. The "seeds" are 4 to 5 millimeters (0.16 to 0.20 inches) long and 1 millimeter (0.039 inches) thick, and straight to slightly curved with a longitudinally ridged surface. The name dill is thought to have originated from a Norse or Anglo-Saxon word 'dylle' meaning to soothe or lull, the plant having the carminative property of relieving gas. The leaves, common known as dill weed (dillweed), also are known as leaf dill. Likewise, the dried fruits, are also known as seed dill. In the northeastern U.S. and adjoining parts of Canada, the seed of dill is sometimes known as "meeting-seed." This expression originates with the Puritans and Quakers, who would give their children dill seeds to chew during long church meetings, due to dill's mild hunger-suppressant qualities. In some English-speaking countries, dill is sometimes called dillby. In some Asian local languages it is called as "shepu" or "sowa." In Kannada it is called Sapseege soppu (ಸಪ್ಪಸೀಗೆ ಸೊಪ್ಪು). The term dill weed to refer to a person is sometimes used as a euphemism in the United States and Canada for more vulgar terms of contempt. In Vietnam, dill is named "thì là." There exists a fable in which God accidentally names the plant "it is" (thì là) (Anh 2006). Dill is native to Eastern Europe, the Mediterranean, southern Russia, and western Africa (GMF). Zohary and Hopf (2000) remark that "wild and weedy types of dill are widespread in the Mediterranean basin and in West Asia." Although several twigs of dill were found in the tomb of Amenhotep II, they report that the earliest archeological evidence for its cultivation comes from late Neolithic lake shore settlements in Switzerland (Zohary and Hopf 2000). Dill was popular in the ancient Greek and Roman cultures, revered for its healing properties and considered a sign of wealth, and it was used by Hippocrates (GMF). Traces have been found in Roman ruins in Great Britain. Charlemagne used it for his banquets so guests could benefit from its carminative properties (GMF). In Semitic languages, it is known by the name of Shubit. The Talmud requires that tithes shall be paid on the seeds, leaves, and stem of dill. The Bible states that the Pharisees were in the habit of paying dill as tithe (Matthew 23:23); Jesus rebuked them for tithing dill (and mint and cumin) but omitting justice, mercy, and faithfulness. Successful cultivation requires warm to hot summers with high sunshine levels; even partial shade will reduce the yield substantially. Dill also prefers rich, well drained soil. The seeds are viable for 3 to 10 years. Plants intended for seed for further planting should not be grown near fennel, as the two species can hybridize. The seed (fruit) is harvested by cutting the flower heads off the stalks when they begin to ripen. The seed heads are placed upside down in a paper bag and left in a warm dry place for a week. The seeds then separate from the stems easily for storage in an airtight container. Like caraway, the fern-like or feather like leaves of dill are aromatic and are used to flavor many foods. Fresh and dried dill leaves ("dill weed") are used as herbs to flavor salads, meats such as gravlax (cured salmon), borscht and other soups, vegetables, and sauces. Dill is said to be best when used fresh, as it loses its flavor rapidly if dried; however, freeze-dried dill leaves preserve their flavor relatively well for a few months. The flavor of the leaves also is lost by heating, so is properly added near the end of the cooking (Herbst 2001). Dill is a popular herb in the cuisines of Central Europe, North Africa, Scandinavia, and the Russian Federation (GMF). Dill seed has very different components than dill weed, and is stronger, more pungent, and more bitter in taste than dill weed (PFAF 2000; MRH 2008). In dill seed, up to 60 percent carvone and up to 40 percent limonene is responsible for the distinctive aroma; dill seed lacks the phellandrene and other monoterpenes found in the dill leaf (MRH 2008). In addition, unlike dill leaf, heating brings out the dill seeds flavor, whereas dill leaf loses its fragrance during heating (Herbst 2001). In Vietnam, dill is the important herb in the dish cha ca. Dill seed is used as a spice, to flavor pickles, sauces, preserves, and so forth. In the United States, it is most often used for the brine in which dill pickles are cured (Herbst 2001). It also is used greatly in making dill vinegar (PFAF 2000). 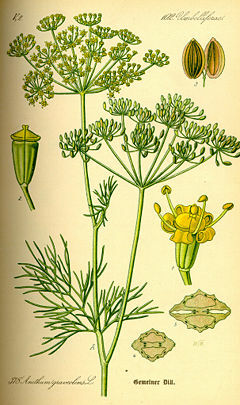 Dill oil can be extracted from the leaves, stems and seeds of the plant. An essential oil from the seed (dill seed oil) is used in the food industry for flavoring as well, and used in perfuming soaps and in medicines. An essential oil also is produced from the leaves (dill leaf oil), but has much less use. In addition to culinary use, dill has had a long history of medicinal use, going back more than 2,000 years (PFAF 2000). Dill seeds were traditionally used to soothe the stomach after meals (GMF), among other digestive problems. It is used to improve bad breath, serves as an addition to various cold, cough, and flu remedies, and with antispasmodics, and used to increase flow of milk in nursing women and prevent colic in the breastfeeding babies (PFAF 2000). It also is used as an anti-bacterial spice, similar to garlic. Anh. 2006. Doing the Vietnamese way!. Food Lover's Journey WHB #58. November 8, 2006. Retrieved January 14, 2009. Cyprus, S. 2009. What is the difference between dill seed and dill weed?. WiseGeek. Retrieved January 14, 2009. George Mateljan Foundation (GMF). n.d. Dill. The World Healtiest Foods. Retrieved January 14, 2009. Mountain Rose Herbs (MRH). 2008. Dill seed profile. Mountain Rose Herbs. Retrieved January 14, 2009. Plants for a Future (PFAF). 2000. Anethum graveolens. Plants for a Future. Retrieved January 14, 2009. This page was last modified on 19 January 2009, at 04:15.